With so many modern innovations in advertising, it's not surprising that there's interest in connecting mobile marketing to digital signage, an industry that grew 14.8 percent in 2010. Digital signage is setting trends, and the marketing landscape is expanding. We see digital signage giving advertisers new opportunities to create calls to action and monitor results in real time. 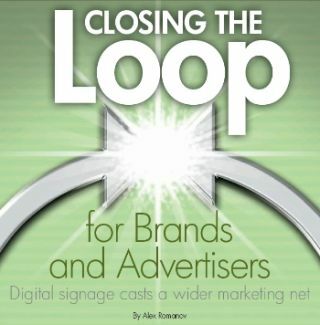 The advertising “loop” is closing as technology changes. Content is being developed to link mobile migration to digital signage, and the effort required to create this connection is decreasing. Digital signage can reduce installation costs and keep consumer response rates at all-time highs, and it has the capability—plus the potential longevity—to connect the dots between leading-edge initiatives. The numbers are in, and they support digital signage. Even if advertisers don’t increase budgets to support digital signage technology—although they are—digital signage is a natural step in proximity marketing. One of the most promising areas in the digital-out-of-home (DOOH) market is digital signage and billboards. Larry Fisher, practice director of automotive, energy and emerging technologies at ABI Research, said digital signs are seen as more compelling, and their real-time delivery allows for ideal deployment in the DOOH advertising environment. ABI Research's recent digital signage study states that the global market for software, signage and installation will balloon from $1.3 billion in 2010 to nearly $4.5 billion in 2016. There's a captive audience waiting, and advertisers are continuing to shift print ad dollars to more-advanced marketing methods. Nielsen reported an 8 percent increase in 2010 on television ad spending, and the predicted comparative drop in print ads currently rests at 6 percent for 2011. The lines are being blurred between marketing channels, with new strains integrating consumers' preferences to form an exciting hybrid. Advertisers are watching as digital signage grows and changes not only in the mobile channel, but in the general multichannel experience. The DOOH environment is more complex, with many more opportunities for proximity marketing campaigns. According to Nielsen statistics, 2011 is considered the “Year of the Mobile,” with Americans spending an average of three hours on their mobile phones every day. The dynamic duo of mobile and digital signage has arrived in the DOOH market, and it's not showing any signs of weakening. Digital signage can be joined with multichannel marketing to form a power pair. Some may wonder how DOOH marketplace signage can be such a natural fit for mobile-TV fusion, but, from a signage perspective, a muted TV is basically a form of digital signage. Mobile marketing has the ability to transition from the home to the DOOH environment and enable a continuous marketing link for advertisers. It is possible for digital signage to be connected to mobile technology, providing a full marketing loop with on-site Bluetooth mobile delivery. Real-time metrics allow for intuitive spending of advertising dollars and fulfillment of consumers' needs as their demographic profile is clarified. Using these consumer profiles in mobile-based proximity marketing can boost metrics for marketers and advertisers, and they can use their real-time results to better plan and execute further digital signage rollouts. Proximity marketing can be up to 100 times cheaper than traditional advertising, and it's considered one of the most effective ways to capitalize on new technology. Digital sign prices are already decreasing, which indicates that they will be used in smaller locales in addition to the prominent venues, where they're already featured. Spotted in airports, banks and malls, digital signage is able to cultivate higher revenues as the technology and its applications are understood. Metrics are the key to success in advanced proximity marketing—not just using digital signage in multichannel communication. Marketers can access real-time data when digital signage is utilized in DOOH environments, making it easy to change an offer, alter signage or double the deals with a positive consumer response. Digital-sign communication is fast, but with real-time metrics, marketers need to be fast, too. Examining metrics and tweaking campaigns as necessary will provide the results advertisers expect and should be able to create with multichannel campaigns. Marketers should not discard traditional efforts when combining DOOH marketing initiatives, such as digital signage and mobile. With proximity marketing, a clear consumer profile can be created, meaning all static marketing attempts gain a more accurate focus. Real-time data provided by proximity marketing continues to strengthen and support existing demographics, with campaign plans incorporating multichannel efforts for the widest reach in marketing today. Digital signage provides links to other leading-edge marketing applications, from 2-D bar code campaigns to the multichannel movement. Marketers need to be well versed in all applications to best take advantage of the growing signage market. “Closing the loop” means that advertisers can benefit from better targeted campaigns that easily move from home to DOOH environments. Connecting marketing channels provides a seamless experience for consumers and a profitable campaign strategy for advertisers. There's no reason for marketers not to experiment with the fluid medium of digital signage.